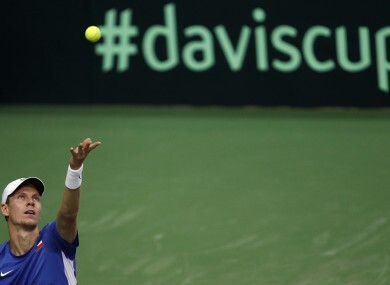 HOSTS CZECH REPUBLIC and holders Spain were tied 1-1 in the Davis Cup final in Prague on Friday as Tomas Berdych beat Nicolas Almagro 6-3, 3-6, 6-3, 6-7 (5/7), 6-3 in the second rubber of the day. Berdych, the world number six and the Czech number one, needed three hours and 58 minutes to see off 11th-ranked Almagro on Prague’s hardcourt. In the first rubber of the day, world number five David Ferrer beat 37th-ranked Radek Stepanek 6-3, 6-4, 6-4 to give Spain a lead. “That’s all we need today. Under the circumstances today, that’s the maximum that we can get,” Berdych said after the epic rubber. “We are one-all, we have opened the chance for Sunday, no matter what happens tomorrow. That’s a good step for us,” he added. Berdych took the first set against Almagro owing to a single break. The fast-serving players — both 27 years old — reversed their roles in the second set, with Almagro equalising. The third set started with a nervous exchange with the umpire, whose verdict in Almagro’s favour turned the home crowd of 14,237 people against the Spaniard. Berdych then capitalised on the frantic support and took the third set. In the fourth, Berdych took an early lead but Almagro levelled with a re-break to take the set in tie-break. And in the fifth, both players traded breaks midway through the set with Berdych emerging on top. Almagro won 21-13 on aces. Spain are missing world number four Rafael Nadal, sidelined with a knee injury. They are looking to add a fourth crown to their three Davis Cup trophies from the last four years, after having won the cup in 2000 and 2004. Czechoslovakia won the Davis Cup in 1980. but if the Czech Republic win the 100th edition of the Davis Cup finals, they will clinch a rare team double, last achieved by the United States in 1990, after their women’s team lifted the Fed Cup here two weeks ago. Email “Berdych keeps Czech Davis Cup hopes alive”. Feedback on “Berdych keeps Czech Davis Cup hopes alive”.